Nearly three months ago, I made a major change: I bought an electric car. Not a hybrid, but a fully electric vehicle without an internal combustion engine and therefore without any fuel tank. In some ways the change might not seem massive. I still put my foot on the accelerator pedal to get moving, or on the brake to stop. The steering wheel moves the car to the left or to the right. I indicate when I intend to turn. And so forth. And yet, this is a fundamentally different experience. The car moves more or less noiselessly. It is heavily computerised, and almost every control is operated not by a lever or button, but on the touchscreen. You ignore filling stations, but spend some time planning your journey (if it’s a longer one) so that you know where you will charge the car. It feels like being part of something quite revolutionary, even when so much of it is the same. And yet, is this the future, or just a staging post to the real thing? Will we soon be in an era in which we won’t drive our own cars at all any more, but call an autonomous self-driving vehicle that takes us where we want to go and then moves off somewhere else? Or indeed will we still take it for granted at all that we can travel at will from A to B? Transport habits can change at a certain tipping point with extraordinary speed. In this image you can see New York’s 5th Avenue in 1900 and 1913. 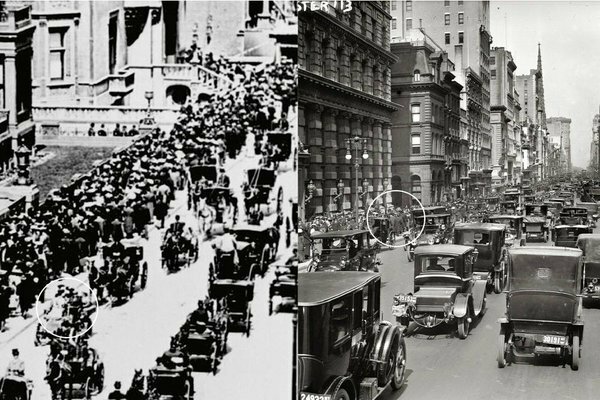 In these 13 years the traffic changed from almost entirely horse-drawn to entirely motorised. What will happen between 2018 and 2030 is not at all clear, but there is every likelihood of fundamental change; and there should be, not least because we need to stop urban air pollution. So maybe I am taking part in something important. Or maybe it is just a very minor step towards something that will, in a short space of time, be quite different. We’ll see. As we head into the next wave of technology-driven social and economic change, it is worth asking whether we always focus on the most important elements of such change. Looking at at the impact of previous and current industrial revolutions, it seems to me that the key drivers of change have always been information and mobility. The printing press opened the previously closed world of scholarship and learning to a much wider social group – potentially to everyone – while the railways introduced physical mobility, thereby effectively ending the feudal system. In particular, mass transport introduced the growth of urbanisation. As we survey the momentum of change associated with big data, robotics and automation, we sometimes forget that transport and mobility will also be key drivers of social and economic change in this next industrial revolution. But government planners are remarkably unimaginative about this: generally it is planning around faster trains, bigger airport runways – essentially improvements in existing frameworks of transport infrastructure. Other preoccupations are, understandably, focused on technology to reduce or remove polluting emissions. But if the 18th and 19th century railways enabled people to make more autonomous choices about where they would live and work, and if that was a key to economic re-positioning at the time, what will be the equivalent in the next phase of human development? To get to the right destination, we need to do more than just tweak or slightly modernise the systems we have now. We need to ask questions of social policy, about what kind of mobility will enhance the quality of life and the generation of fairly distributed wealth, and how that can be delivered. More importantly, we need to decide what social and technological research should start now to make that possible in the near future. Anyone following contemporary debates about the future of work and civilisation will, sooner or later (and very probably sooner), be listening to comments about the ‘Fourth Industrial Revolution’. It’s everywhere, and while its exact meaning may not always be clear, what is constantly repeated is that it is happening now and is changing absolutely everything. Everything is being digitised, brought online, automated, and subjugated to robotics. Your job and mine will go, we will be replaced by machines that will not only do the job better, but will also understand better than we can how the job needs to evolve. The jobs we may apply for 10 years from now don’t on the whole exist yet, so we can’t properly prepare for them, and the best we can do is acquire every possible transferable skill and find out what will still need real human interaction; unless robots get better than us at that too. And watch that toaster, it’s online, smart, and may be planning to do away with you so it can watch daytime TV rather than bother with your nutrition. As with everything else, the best thing to do when you encounter breathless hype is to take a step back and think about what you are being told. There is no doubt that the digital world is moving at a fast pace and is changing how we do things: how we communicate, how we analyse, how we adapt our technology to improve safety and efficiency, how we access news. The ‘internet of things’ is creating smart gadgets and appliances. Big data is yielding insights and solutions that eluded us in the past. But the use of science and technology to effect social and industrial change is not new, nor are we now witnessing profound and speedy change for the first time in history. The development of the printing press and the use of paper to allow high-volume dissemination of its outputs probably produced a bigger social upheaval than anything we are seeing today: suddenly information and knowledge were no longer the private property of the elite, and absolutely everything changed. The (first) Industrial Revolution totally changed the way we live and work, in particular by opening up mass transport and urbanisation, putting an end to agrarian societies with feudal structures, and ushering in the age of capitalism with its attendant consequences, good and bad. The two world wars of the 20th century changed global politics beyond recognition. Contraception changed social interaction and opened up the workforce. It may be interesting to observe that while a typical person, not from any social elite, would have had a fundamentally different life in the 19th century from what a similar person might have had 100 years earlier, the life we live now is not so fundamentally different from that experienced in the post-war 20th century. The technology has changed and allows us to do things that we couldn’t have done before or which would have been much more laborious, but socially and culturally our experiences are still recognisably similar. What is it that makes us think that the next few years will be so totally different? We have always been bad at predicting the future, particularly where technology is involved. This is in part because we sometimes predict the future with the same kind of sensibility we apply to science fiction, including the desire to get a thrill from something really horrible. So when Elon Musk makes our flesh creep at the prospect of the spread of malignant artificial intelligence, he is tapping into the same fascination that gave us the Terminator movie franchise a couple of decades earlier. And to be honest, I’ve got sick of the statement (by now a real cliché) that 40% (or whatever your preferred percentage is) of jobs in demand in 10 years time don’t exist today. Well, maybe they don’t, but history doesn’t support this proposition: what job known to you now didn’t exist 10 years ago? Jobs may change in what they demand of those doing them, but that is a natural process of evolution. This blog post is not an invitation to go into denial about the pace of change today. There is of course a huge technological, digital, fast-paced evolution taking place. Google, Amazon, Uber, Airbnb, Tesla – even the possibly departed Cambridge Analytica – are changing all sorts of things in our lives. But how adapt to that, and how we reform society to contain the risks, are issues to be debated and decided in a sober frame of mind. In that process, we do well to look at some of the social fundamentals, such as how we can protect the integrity of truth in the face of all-out assaults by those wanting to manipulate us, and perhaps worry a little less about what our toaster might get up to. Even if the latter is more fun, in a Hitchcockian sort of way.